I’m always amazed at how my fanaticism for gardening has grown exponentially, but it’s most apparent in my seed starting efforts. When I first got serious about gardening I didn’t grow anything from seed. Who has time for that, I thought. And it seemed like it would be difficult and require all kinds of equipment. It scratches that nagging gardening itch that is so prevalent in late winter and very early spring. Honestly, it’s a method of maintaining my sanity. 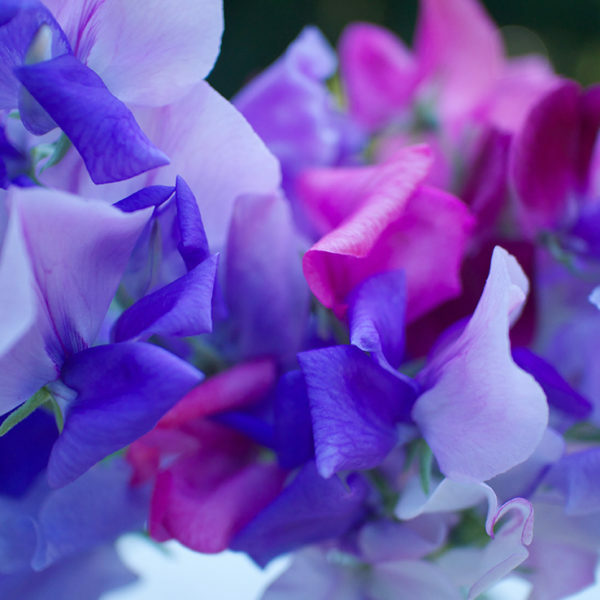 I can grow varieties of flowers and vegetables that I just can’t find at a garden center. I love to pack my gardens full, and there’s no way I could afford to do that if I had to buy all the plants. 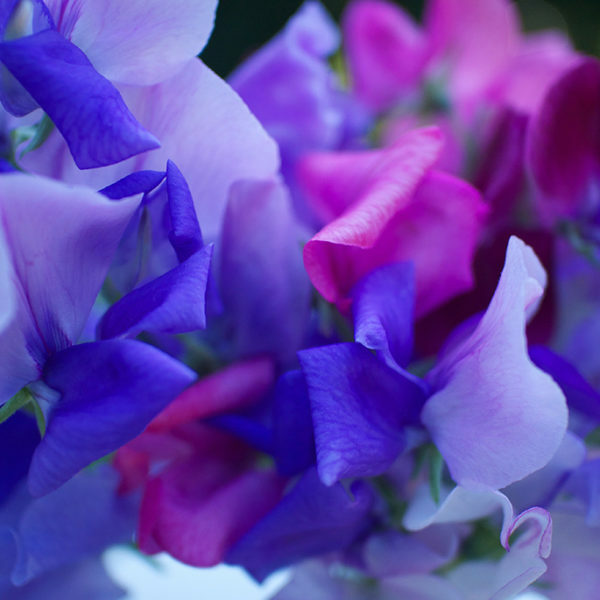 There is an incredible sense of pride and accomplishment that comes with growing a plant from seed to bloom or harvest. For food crops, I like knowing exactly how my vegetables were grown since they were seeds. 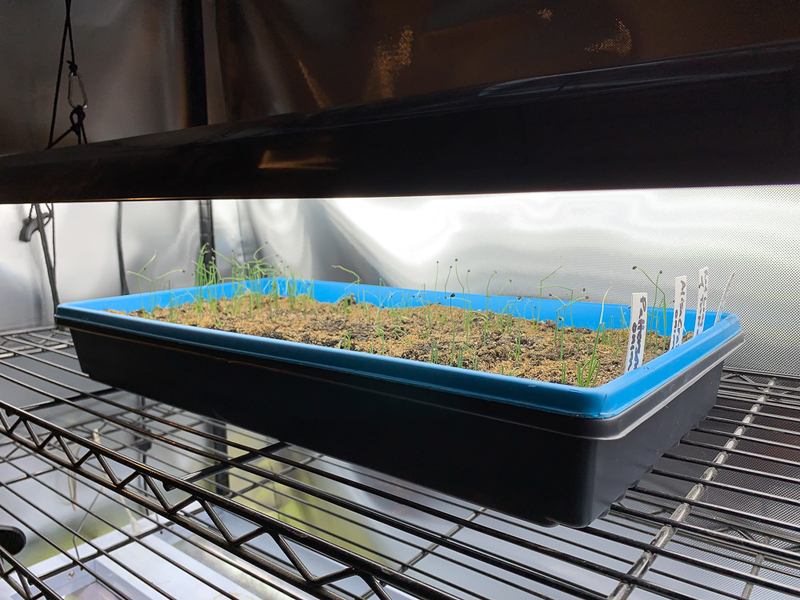 In the past I’ve started seeds in our den/office because I wanted to take advantage of the natural light through the patio doors to supplement the grow lights. But after awhile seed starting gets messy and takes up a lot of room. Plus I don’t think it’s good to be working in a room with all those LED lights glaring. So this year I moved the entire operation down to the basement. Mess is no big deal down there and it’s a little cooler, which seedlings prefer. Plus, it’s easy to take seed trays over to the dog bath (we took out the utility sink and replaced it with a walk-in dog bathtub) to water them. But the loss of supplemental natural light is a concern. So I made a small upgrade to my seed starting facilities this year. My whole set up is pretty cobbled together, a combination of gear I’ve collected over time and replaced or upgraded as necessary or as I’m able to. This post contains affiliate links that may allow me to earn a small commission if you purchase through them. Thanks for your support. My new seed setup is a bit cobbled together, but includes three lights, a germination heat mat and room for several flats of plants on a rolling utility rack wrapped in reflective vinyl. I grow everything on a 4-foot-wide rolling utility rack (something like this) with adjustable shelves. I have three different grow lights on it: One 4-foot wide, four-light florescent T5 light (this one), a full-spectrum smaller LED light (this one) and a 4-foot long LED light (this one). None of them are perfect. The florescent light is noticeably darker than the others and truly needs to be just a couple inches away from the plants, but it also gets hot and it will burn a seedling if it touches it. And it also uses a lot more energy than the LEDs. I haven’t quite figured out the full-spectrum light yet. It should be putting enough light out to be kept much higher than the others, but I feel like my seedlings stretch under it. But if I move it closer, it’s effective light area is reduced. It also has switches for different color LEDs—red lights for leaf growth and blue lights for flower production (or maybe it’s the other way around)—which I can’t really figure out so I just turn them both on. It has loud fans as well, which isn’t a problem in the basement but it was when it was in the office. I like the last light, the long LED fixture, the best, but it has a glitchy connection between the last two bulbs that I’ve had to jury rig and now that I go back and see what I paid for it, I’m not thrilled. I’ll admit I haven’t contacted the company about it though, so that’s on me. 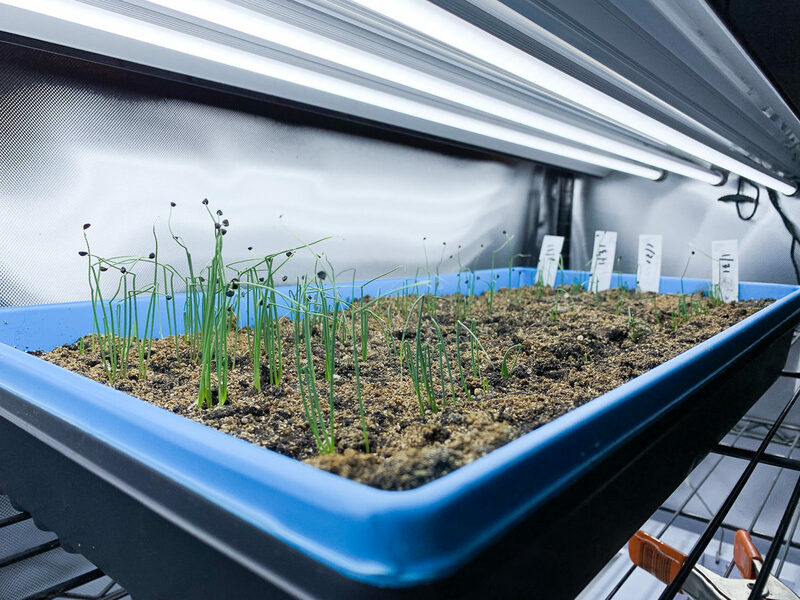 The long LED light doesn’t throw off heat like the florescent grow light does, allowing seedlings that like it cool, like these onions, to grow happily. Onions are one of the few seeds I sow in a flat full of soil; usually I prefer to use soil blocks. The blue flat has drainage holes and it sits in a non-draining black flat. In order to make the most of the lights I have, this year I created a three-sided “tent” out of reflective vinyl-backed mylar (I bought this thicker version as I read that the thinner stuff ripped easily). I used mylar ducting tape—not actual duct tape, the dull silver insanely sticky stuff, rather the stuff you are actually supposed to use on your ducts. That’s all very confusing. I used this. On the bottom rack I have a heated germination mat. I have used this one for a few years but recently upgraded to this one that can accommodate more flats at a time. 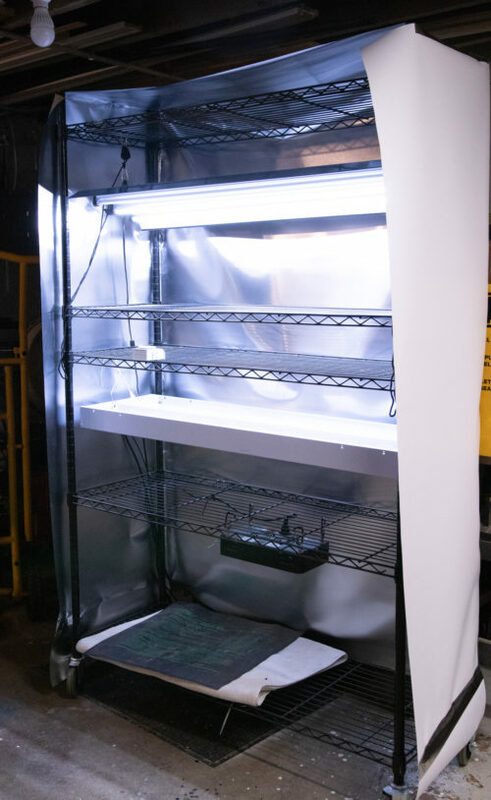 If the rack gets full of plants under lights, I can always move the germination mat (which I only keep seeds on until they germinate and then I ditch the humidity dome and move the flat under lights) to the workbench or top of the chest freezer. I have a thermostat, but I’ve never found it to be accurate, so if it seems too hot I lay a towel down on top the heat mat, under the flat. The cords from the lights and a 6-inch clip-on fan for air circulation are bundled and led down the back “leg” of the rack, plugging them into a power strip that leads to a timer. I set the timer to leave the lights on for 18 hours a day. The germination mat runs nonstop, so that is plugged in separately so it’s always on unless I unplug it. That’s a whole bunch of stuff, but since I added things as my seed-starting efforts (I think at this point we can safely call it an “operation”) expanded, I never laid out a lot of money all at once. Of course there is other equipment I use to start seeds. Other than seeds and seed-starting mix, I reuse everything from year to year, and I save as many nursery pots as I need for transplants so I never have to buy pots. Seed-starting mix — This is my old standby, and what I use in soil blocks (recipe here). New seed starting mix I’m trying — This supposedly works in soil blocks by just wetting it. Heavy-duty flats with drainage — For seeds planted in a bed of soilless mix (aka onions). Grid-bottom flats — I use these for soil blocks, then set them in a solid flat to water from below. Humidity domes — Nothing fancy, but not too flimsy. If they need air I offset them from the flat a little. 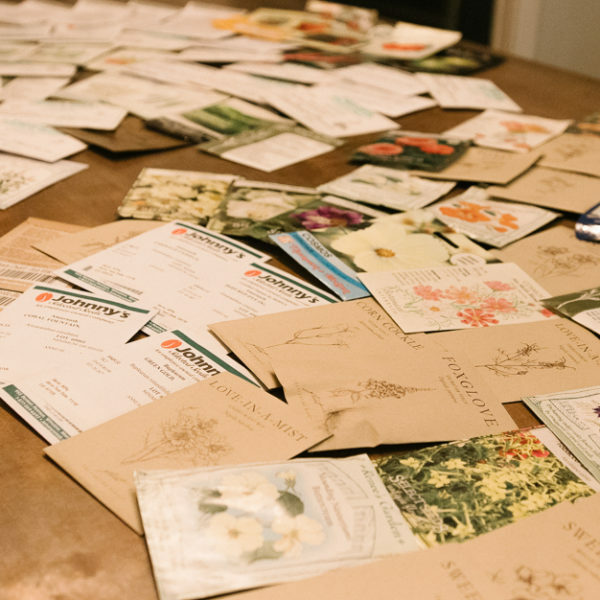 Plant labels — Don’t be stingy; all seedlings look alike and you will not remember. I buy cheap labels in bulk and reuse them when I can. You do have an operation. What fun it must be to have someplace to go (into the basement) to contemplate the garden. I wish I had room for such an operation. I admit that having something growing right now is a big mental health boost. But our basement is Mark’s photo studio and storage for all of our artwork which is about the amount a medium size art gallery would have. So no room and we don’t want any extra humidity down there. But I continue to be impressed with all you do in and for your garden! 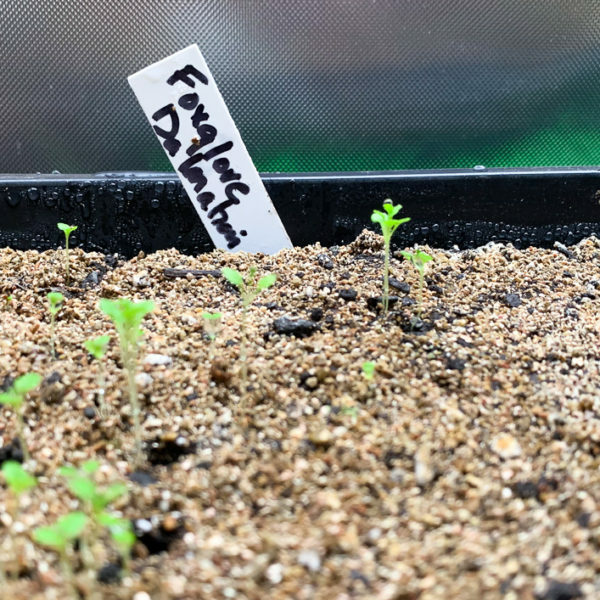 I have a makeshift seed starting area in my lower level – I start the seeds in my utility room and then move them out to a folding table in the main part of the lower level, where it’s cooler, once they are stronger and I need to start the next batch. I use grow lights to help them along, and when they are bigger and sturdier and the weather starts improving they go up to the deck during the day, and onto the kitchen counters overnight. It’s a process, but I love it! I keep looking at those small temporary greenhouses….perhaps this is the year I buy one to help protect the plants at night without taking them into my kitchen. Just found your blog through another site, I’m excited to bounce around!! Very fancy! I used to have my light set up in our sons old bedroom. That was fine until he came to visit one time and of course slept in his old bed – only to be woken by blindingly bright lights at 6am as the grow lights came on. Oops…. This is too good, hereafter ill regularly visit your blog for the valuable information.